PILLING, a village and a town ship-chapelry in Garstang parish, Lancashire. The village stands near Lancaster bay, 6½ miles W of Scorton r. station, and 6½ N W by W of Garstang; and has a post-office under Preston. The chapelry comprises 8,017 acres. Real property, £6,850. Pop. in 1851, 1,281; in 1861, 1,388. Houses, 234. Much of the land is peat-moss; and large quantities of turf are cut. The living is a p. curacy in the diocese of Manchester. Value, £124. * Patrons, E. Hornby and J. Gardner, Esqs. The church was rebuilt in 1735. There are a Wesleyan chapel and a slightly endowed national school. Local studies information is held at Fleetwood and Garstang libraries. Details about the census records, and indexes for Pilling. You can also perform a more selective search for churches in the Pilling area or see them printed on a map. The Register Office covering the Pilling area is Lancaster. Ask for a calculation of the distance from Pilling to another place. "PILLING, a township and chapelry in the parish of Garstang, hundred of Amounderness, county Lancaster, 6 miles N.W. of Garstang. Preston is its post town. The township, which is extensive, is situated near Lancaster Bay, and is wholly agricultural. Peat is dug at Pilling Moss, which partly burst in 1745. The village is straggling. The living is a perpetual curacy in the diocese of Manchester, value £124. The church, dedicated to St. John the Baptist, was formerly situated at some distance from the village, but was rebuilt in 1731. The present edifice is a commodious structure. There is an endowed National school, founded by Robert Carter in 1710. The Wesleyans have a place of worship." In 1835 Pilling was a township in the parish of Garstang. You can see the administrative areas in which Pilling has been placed at times in the past. Select one to see a link to a map of that particular area. 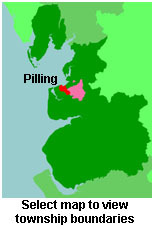 View maps of Pilling and places within its boundaries. For probate purposes prior to 1858, Pilling was in the Archdeaconry of Richmond, in the Diocese of Chester. The original Lancashire wills for the Archdeaconry of Richmond are held at the Lancashire Record Office.